I recently purchased these gummies (I have to clean them) for rack mounting. 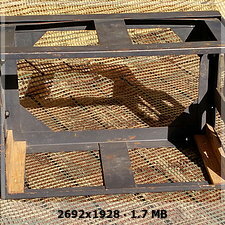 Has anyone copied a rack from a tank to keep the equipment more or less as it was in its original location? Is there any photo in good quality to be able to make a copy in good condition?...I have a few but they are the ones that circulate on the www and the quality is not very good. The best source of detailed information on these is "Die deutschen Funknachrichtenanlagen bis 1945" book 3 "funk-und Bordsprechanlagen in Panzerfahrzeugen" by Hans-Joachim Ellissen. A copy is currently available at Emig Militaria. There are a number of drawings with dimensions in there and an enormous amount of other information. I am not a German speaker, and still consider the book without peer. I have made one of these frames after studying all the internet photos and the above book. It has to be close to the originals. These are an enormous chore to make, and no one could pay me enough to make one. Of course the size has to be perfect to fit the radios. Bakelite slider blocks are fitted inside where the radio rests. The way the clamps work is especially unclear. 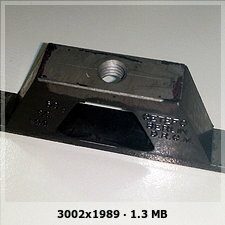 The clamp latches are the same as radio lid latches and are being sold as repros on eBay. I have some photos from the internet, but they are probably the same you have. Goood!! !.Thanks for the answers to all three of your questions and yes me_130 the pictures are really good ( Gracias Carles). Maybe as soon as I finish the project now I'll get to the east frame, I don't think it's difficult to calculate the measurements.I'll be telling you about my progress. Hi. I finally got the plans for the racks from the book you told me about ( BTaylor). As soon as I have some free time I'll get to work. I'll tell you about my progress. 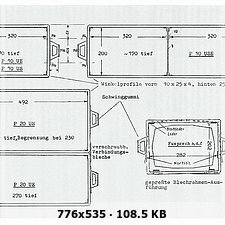 I put the picture of the schematic I found. Here I have more gummis, this time they're new, I don't think they're original but they're perfect. Bushmakow in the Czech Rep Ebay? 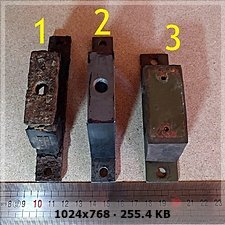 Are these reproduction gummi mounts still available? If not, what did they cost? I would put them on my repro frame, perhaps. Another thing.........I got a rack for the setup....and it has a mark on the top, I don't know if it's a fake or if it's real....someone can tell me??????. I put the pictures up. Nothing there that would tie in with a "JF" logo but most of these are early war attributions so a bit more research could be beneficial. 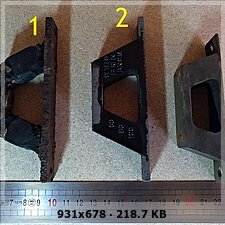 I have uploaded three new photos, the first one is 100% original, the second one is a perfect replica, and the third one is the dubious one. 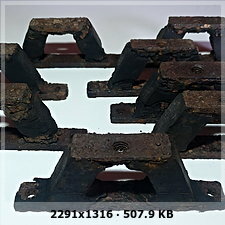 Indeed this confirms that rubber #3 is a British one, I think these were used in the 19 set vehicle mounting and indeed they are shorter than the originals. They are sometimes sold as WW2 German ones and can catch out the unwary. 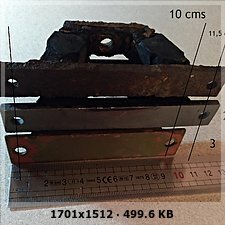 If the 10 cm ones are the only holes in the frame, it indeed raises more questions as original holes should be present at 11.5 cm. 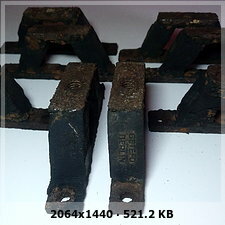 Mind you, I have some original frames without any holes present so it appears they were sometimes delivered "undrilled" before being fitted to the vehicles. Where is the maker logo situated on the frame? 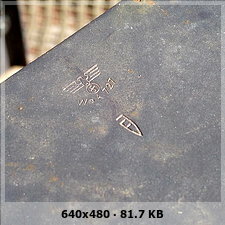 I have only seen orignal markings on the top crosspiece where they are also sometime painted with "P10UE" markings.